Are you beginning a jump rope fitness regimen? When it's time to get fit, the Crossrope Starter Set is the ideal exercise jump rope set for beginners and seasoned jumpers who want the most versatile jump rope system available! Includes Crossrope Rugged Handles, 1/4 Lb Agility rope, and 1 Lb Intensity rope. Two jump ropes. One effective system. Both ropes can be used on any surface so you can train anywhere. 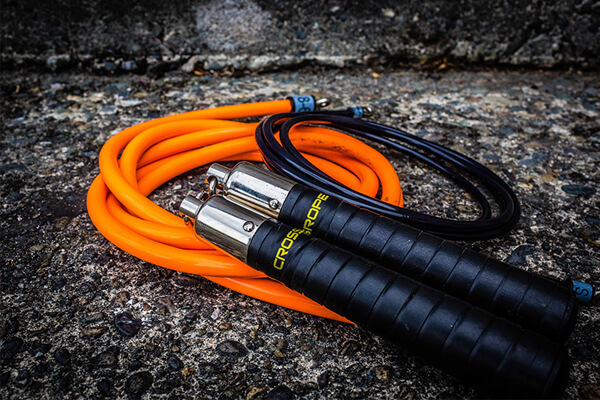 This is the ultimate portable, full body training jump rope system. Use the versatile Agility rope for skills like double unders and intense cardio sessions. Our heavier Intensity cable is an excellent weight for beginners learning to jump rope or advanced jumpers looking to improve power and conditioning. Comes with our Jump Without Limits quick reference guide to give you technique tips, starter workouts, and jump rope challenges. The Starter Set offers a perfect introduction to the versatility of an interchangeable jump rope system that can be used anywhere. By transitioning between a lightweight rope and a heavier weight rope in your workouts, you can improve your rope jumping ability and fitness level. Take your workout with you wherever you go! Improve fitness and build endurance with the 1/4 Lb Agility Rope. Improve definition and build power with the 1 Lb Intensity Rope. Both of these ropes are ideal for beginners & experienced jumpers because the weight in the rope provides feedback that improves the ability to learn rhythm no matter how uncoordinated you are! Both ropes are labeled with the name, weight and length for easy reference. These are an amazing set of ropes! It's a bit pricey compared to all the other ropes but by far, these are the best weighted ropes I've used. The concept of having the weight distributed along the rope rather than handles makes you work much harder. The handles feel great and the bearings make rotating the rope very very smooth. The tennis wrap makes holding it comfortable, and I believe the handles themselves weigh about 10oz all together. The handles just feel very solid and well made. The hook makes changing ropes pretty easy. Overall, it has a solid build, bearings make the rotating the rope super smooth and they're comfortable. These are awesome and they don't tangle! The 1/4-lb feels the same as a normal jump rope in terms of weight, so if you're experienced, you can go pretty fast with these. The 1-lb is a different story, doesn't feel too heavy until you start jumping, you can really feel your forearms work. It does say indoor/outdoor, but I tried it in my backyard pavement where it's a little rough and the 1-lb was already having some deep scratches on it, the 1/4-lb seemed okay though, most likely because it doesn't have as much force hitting the ground. I ended up moving into the garage and taped a piece of cardboard to the floor and started jumping on that. If you plan on jumping outdoors, I would have either a mat or cardboard (unless you can find a smooth surface like tennis court). I have been working out with a speed rope for some time now and have been enjoying the cardio burn. There is a definite difference between speed ropes and these. The quality of the handles and ropes is far superior. I love that I can feel the workout all the way up through my shoulders. I found the speed rope tricky to find a good rhythm, but these ropes are heavier and more intuitive. I found a great rhythm and would 100% recommend these ropes. Try it, you won't go back. Discover the best fitness jump rope set for beginners. Order your Starter Set today!